Herons are not known for preying small mammals but these intelligent birds are known to adapt flexibility in their feeding habits and in this case the cutesy bunny just got unlucky. 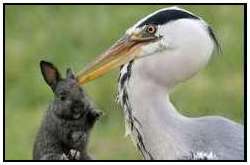 The little rabbit was drowned in the water which also makes the rabbit more slippery to down into the heron’s throat. It’s interesting to see the cycle of life in nature but its pretty disturbing to see birds that should be eating fish taking a taste of small land mammals. Perhaps the photographer should have rescued it instead of just observing but then again the heron would probably just look for another prey. Tokyo-born artist Takahashi Toshi (T Dog Junior) moved to London 11 years ago and began working at a Carnaby Street Jewelry shop. 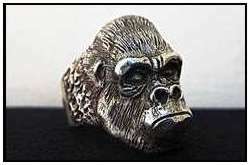 Since then he has been producing unique, handcrafted jewelry with precision and startling realness, and in 2004 launched Dog State jewelry specializing in modern skull and animal designs — along with some randomness like MF Doom’s mask and Frankenstein thrown into the mix (a personal favorite being the “Smooth Skull” below — just wicked). Toshi’s understanding of traditional craftsmanship and his ability to manifest iconic figures in precious metals has produced a headturning, at times beautiful collection of high end jewelry. His creations are available for about $220 (£ 140) each. Born in Cuba in 1982, Cesar Santos immigrated to the United States in 1995 where he began to develop his artistic interests. 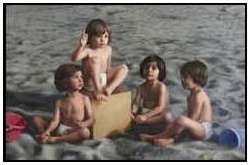 Recently Santos lived and worked in Stockholm, Sweden, where he actively taught and gave workshops in the traditional manner of drawing and painting at the Atelier Stockholm, an ARC Approved™ Atelier. 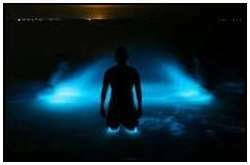 In the Gippsland Lakes in Australia bioluminescence is a very unique, beautiful, and rare phenomenon that results from a chain of events such as flash floods, storms, and bushfires that triggers a population explosion of one particular type of algae. Photographer Phil Hart, 34, snapped the bizarre sight as his friends emerged from a lake in the dark of night. The spooky light is created by a chemical reaction called “bioluminescence”, which happens when tiny organisms in the water are disturbed. It is very strange to observe and might make the observer think that were being invaded by another extraterrestrial species.